Princess Sapphire and Emerald the Witch, who live in Mixtopia, a land where everything is a little bit topsy–turvy. In this first adventure, the two friends are invited to a wedding party in Fairyland. After deciding upon their gladrags, the girls are on their way, it looks things aren’t quite as they should be. Can Sapphire and Emerald sort out all the muddle? This is where the audience comes in! By doodling, illustrating and glittering it up, the reader will make the party of the year happen, and help tell the story! Magical Mix-Ups follows the same format as bestselling Mega Mash-Ups by bringing together themes that will particularly appeal to girls to create fabulously interactive tales. Birthdays and Bridesmaids, the first in the series, is a fun story which will appeal to its intended audience, and the narrative is strong enough that it flows well by itself, so readers do not have to get involved in the drawing to make sense of the story. But hopefully they will want to, and those who who will are not only encouraged to get creative, they are actively encouraged to let their imaginations go totally wild, especially with instructions such as “Mad hair here, please!”. There is so much detail to add, from the tiniest (choosing the colour of Sapphire’s nail varnish) to the more intricate (design a poster advertising party goodies). The two-tone illustrations (black and pink) and the theme obviously emphasise the “girliness” of the series. However I think Leigh Hodgkinson’s style and her fantastic way of drawing princesses help keep a good balance: the artwork girly but not over-sweet, and a quirky and modern twist to traditional themes. Thanks to the overlook of the illustrations and the tone of the narrative, the readers will soon realise those girlies are no pushovers! 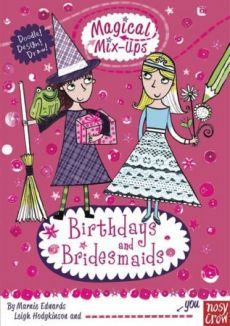 It is so hard to strike the right balance and not tip into a stereotype nightmare when dealing with generally girly themes but Birthdays and Bridesmaids does it brilliantly. After the success of Mega Mash-Ups, a new series in the same format aimed at girls is a welcome addition to the already impressive list from Nosy Crow. Magical Mix-Ups will encourage creativity, dexterity and will nurture storytelling skills. And let’s be honest, anything that actively encourage the use of glitter is going to be a winner with young girl readers, isn’t it? If like me you are putting together a selection of activity books to get you through those rainy summer days while the children are at home, be sure to add Magical Mix-Ups to it (and if you have not discovered Mega Mash-Ups yet, have a look here and here). Thanks for this Library Mice, I am most definitely on the look out for some new activity books and these books from nosy crow will definitely be on my list. What other good activity books have you found? Please share! I am only just starting to think about it. So far I have copies of Usborne’s “Write Your Own Story Book” for both of them. I will also get them an activity box from Djeco – not technically books of course. O has been after another one for their Manga sets for ages. And I’ll get R the glitter board ones, or their unicorn and fairies colour by number.I need to get some book sorted though as I have to entertain them on the ferry to France!